As an autograph collector, one of my collecting priorities in the last decade is trying to get as many cards from particular baseball card sets - signed either in-person or through the mail. Probably the first set I've tried it with is the 2001 Fleer Tradition set - I didn't like the particular product when it first came out, but I picked up a factory set 'back in the day' for around $30. The factory sets included a 50-card rookie subset with rookie cards of Albert Pujols, Ichiro and Mark Teixeira - that wasn't available through packs or hobby/retail boxes. After realizing I was stuck with this complete set, I ended up attempting to get the 400-card set signed - minus the 50-card rookie subset. Fast forward to 2009 and I've probably half of the set signed in one ink or the other and either in-person or through the mail - there are some players who have slipped through the cracks [that I've never gotten] and some players who have died [Ken Caminiti and Darryl Kile]. 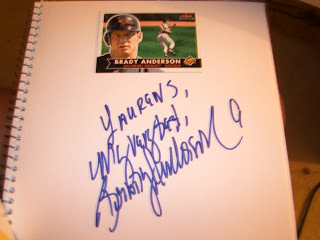 Brady Anderson was one of the players whose card I still need signed from this set and I'd stumbled on a supposed list of signers through the Major League Alumni Marketing - which I assume is a way for the Major League Players Alumni Association to raise money. Anderson [$15] and Ray Lankford [$20] were the two players that stood out [other notables included Stan Musial - $85, Mike Schmidt - $70 and John Smoltz - $70] - as 'sorta tough to get guys, now they aren't playing,' whom I still needed on 2001 Fleer Tradition cards. So I looked at the list and wondered if it was worth getting Anderson and/or Lankford at a mail-in signing, so I could get them out of the way - I'd gotten Anderson's autograph a handful of times in his playing career, but before the 2001 Fleer Tradition came out. I'd never gotten Lankford before and while I'd equally needed both of their 2001 Fleer Tradition cards signed - Lankford was the more intriguing name. I'd looked at the list late Tuesday night and was still thinking about it Wednesday - not a big deal I suppose, though I had a couple of options to be able to knock out a couple of set cards. I go to the Angels day game against the New York Yankees [9/23] and walking up the aisle from the field level before the game - and out all the random people I might see [among former players perhaps], there is Anderson [though he is in his mid 40s, he still looks like he is in his early 30s] coming up from the ramp, looking for his seats, somewhere in the terrace level. I literally smack myself in the head, since I was thinking about the chances I'd ever see him - to get him to sign his 2001 Fleer Tradition [#77]. However, there was no 2001 Fleer Tradition card with me - I'd leafed through a stack of various setters [particular brands of baseball cards to get signed under the premise in the first paragraph] I'd put together last night and Anderson was the top card. It never occured to me to bring any card [much less the 2001 Fleer Tradition] of Anderson - it looked like he had some sort of 'field pass' thing he was wearing around his neck, but I didn't know why he would be at Angel Stadium. Anderson was still trying to figure out where his seat was and I was following him like I was some sort of lost puppy - when he finally sat down, I asked him to sign a blank page out of my autograph book. He asked for my name and I dilligently spelled it out so he could scribble it out, add a short inscription and sign his name. It was pretty cool to get Anderson - though I keep thinking of the ways [now], how I can be prepared for the next time I see someone I need on one of my setters. Fighting the apathy - with auxiliary boxes. During a given year, I'm adding, subtracting and basically moving baseball cards around - organizing them gives me an opportunity to play with my cards in a creative way, keeping up to date. How do I see the collection of trading cards I have as a farm system of sorts, where there is classifications [and levels] like a Major League Baseball team has its AAA, AA, A and short-season teams? A.) Collecting topics box – my bread and butter collecting activity because it is sort of a scavenger hunt, where every card matters. I try to put all the cards I've picked up into a database. There is no official checklist, so if I see a card fitting the description, I have to grab it or else you may lose for a while - I have to look for baseball card images online to see if there is a card I can find in-person through common bins. When you sort through cards in-hand, it is nice watching unique theme come together as I am able to classify cards - I'd otherwise overlook. B.) Cards for autographs box – arranged by ABC order and team, constantly updated. I need to stick to picking up cards of younger players - guys who are more willing to sign. As far as veterans who can still be accomodating - I'll see if I can stick with the high-brow set builder products like Topps Allen and Ginter. C.) Free agent/no-team transaction box – this stack of cards feature players who have bounced around and may still be looking for a team. To thin it out, at any particular time, players' cards can be removed from this box if the player has been MIA long enough, where he isn't likely to appear anywhere. D.) In-season/off-season update box – traded/free agents/et al; one a set of cards for a particular year covers in-season transactions and another set covers off-season transactions up to the next season's opening day. It probably isn't realistic to cover every update made, but I hope to cover 50-100 updates through individual players' cards. I figure I can always add on a card of a player I missed later on, though I make to make updates as they happen - I want some kind of cap on the number of cards I have for any particular year at probably around 100-150, without missing any of the 'big moves,' but also covering the more obscure ones [with Major League and minor league players]. E.) Baseball rookie box – I hope to have about four or five rookie represented for all the teams, though I probably don't have cards for every player and may have to hunt them down the following year. Any card before a particular players' actual MLB rookie season is ideal to use and any card released the released after the rookie season. There will be cases where a handful of cards used in a given year's collection will be autographed; the goal is not to have an autograph set, though it is nice to have autographed cards to use for the particular box. F.) Auxiliary A-Z box – I dump the cards I'm not going to use for autographs [within a season] here and once there is some 'build-up,' the cards are broken apart to be put in the main A-Z archives of cards. G.) Team box – I dump the cards I'm not going to use for autographs [within a season] here and once there is some 'build-up,' it is sometimes fun to see a handful of assorted cards of one Major League team, sometimes featuring players of different eras, various brands of baseball cards and different years. H.) Star A-Z box – I've got many cards of 'stars' from the last 20 years in binders, but when I get lazy, this is where I dump base star cards. I.) Semistar A-Z box – have an 1980s/before section and a 1990s/present section; may lump in cards of the eras' stars if they aren't in plastic sheets yet. J.) Award winners – I don't want something just cobbled together on the fly, though that may have been the idea. You haven't tracked down certain players and maybe the card types are too broad: non-certified autograph cards, retro cards, maybe beaters, GU cards, ugly subset cards, non award-winning year appropriate cards. Maybe I've finally outgrown my tendency to collect, just for the sake of collecting baseball cards - and find myself without an excuse to get excited about particular baseball cards, no one is going to care about. I'm walking around aimlessly at a card show and I'm sifting through various baseball cards at the few booths who have them - no trading card trinkets for me to leaf through and pick up, unless I can get them autographed in-person or through the mail. At a random booth, on a unbearable hot afternoon, maybe I'd like to spend $1-$5 on some cheap cards [maybe a jersey card, a 'no-name' certified autograph card or 'off-condition' rookie card [not quite 'mint'] of Lance Berkman, Jayson Werth, Aramis Ramirez, Brad Hawpe, et al] - but all these baseball cards just bore me, no matter how great of a year a particular guy who is pictured on the front is having, how great of a career he has enjoyed or how a particular card is now worth a couple of bucks [when it was worth $15 or more at one time]. I like collecting topics cards I can find out of the commons bin - but sometimes I feel like the types of cards out there are all obsolete and I want more. What 'more' is, I'm not quite sure - but I may just want nothing to do with 95 percent of baseball cards. Adrian Gonzalez is the face of the San Diego Padres organization - a sweet swinging first baseman who is basically a Mexican-American version of Rafael Palmeiro without the Viagra endorsements or the failed steroid test. Here is a nice story about Gonzalez' batting cage at his old home - being a haven for the 2009 Little League Champions.